I find it quite amusing that the previous Sherlock Holmes movie was the first film I watched (in the cinema) in 2010, and now the sequel is the last film I see (in the cinema) in 2011. 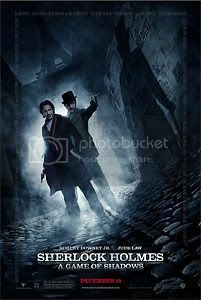 Sherlock Holmes (Robert Downey, Jr.), still sarcastic and still eccentric, is caught up in the investigation of a series of bombings and is hot on the tail of one Professor Moriarty (Jared Harris). Dr. Watson (Jude Law) finds himself somewhat reluctantly dragged into the whole affair (poor fellow has his honeymoon interrupted thanks to that). Holmes and Watson traipse around Europe – well, mostly France, Germany and Switzerland – with the help of a gypsy woman (Noomi Rapace) to stop Moriarty’s grand plan to cause another world war. The film is entertaining, though I think it’s just a little too frenetic. On the upside, that means there are no long pauses in the action to bore viewers. The plot skips – almost flies – along at a rapid pace, going from one action set piece to another. A skirmish in a back alley, a brawl at a gentleman’s club, attempted murder in a train, an explosion in a Paris hotel, a major fight in a German arms factory, and the climactic moment at the Reichenbach Falls… to name a few key set pieces. What I find most interesting about these Sherlock Holmes films by Guy Ritchie is the way he portrays Sherlock’s thinking process before or during fights – the sudden freeze frames and slow-motion accompanied by Sherlock’s predictive narration before resuming normal action. It makes it seem as though Sherlock has a Jedi-like ability to predict his opponent’s moves. That isn’t a feature mentioned anywhere in Conan Doyle’s stories, but it is rather believeable in the context and the characterisation of Sherlock Holmes in these movies. It also has the added advantage (as I see it) of slowing action for a moment and allowing the viewer to digest what has happened and what is about to happen, without ruining the flow of the story. Irene Adler (Rachel McAdams) dies in the first ten minutes of the film, which is a little bit surprising. But her death adds an emotional dimension to Sherlock Holmes’ pursuit of Moriarty. While it is something that does not come in anywhere in the original stories*, it does humanise Holmes a bit – he isn’t just a cool, calculating (and bizarre) genius, but he also has a heart although he doesn’t show it. * Irene Adler and Sherlock Holmes have no personal relationship at all in the stories; and she only appears in one story though she is noted as the one woman that sticks out in his memory for being able to thwart him. If there’s one thing I wasn’t pleased with, it was the depiction of Sherlock’s brother, Mycroft (Stephen Fry). He just came off as rather silly – especially in that scene where he walks into the room and gives Watson’s wife a near heart attack because he’s wearing nothing at all. It felt like Mycroft was portrayed as being even more socially inept as Sherlock, and for no other reason than that it would be amusing. It didn’t contribute to the story at all, and it spoiled the character somewhat as well. Other notes: Music – great; Hans Zimmer’s score was, as usual, impressive and really helped set the tone of the movie. Effects – both visual and special effects were good (they’re rarely bad these days anyway). And I have no complaints about costume or production design. All well-done. A good movie overall, though I think I still prefer the first one for its slightly better pacing.